A few weeks ago, I decided to reorganize my Apple TV’s home screen. This is a task that I perform far more frequently than any normal human being should. It’s an addiction. At least once a month I take stock of the applications I have installed, uninstall any apps that I no longer use, and organize them into the folder structure that I’ve devised. This isn’t something that’s exclusive to the Apple TV, I also go through this little ritual on my iPhone and iPad with a similar frequency. But this latest instance on the Apple TV was particularly revelatory for me — it has changed the way I interact with tvOS. I had previously discovered a neat little trick with folders in the top row. As it turns out, if you create a folder on your Apple TV and place it among the top row of apps, you can scroll through its contents from the Top Shelf. I hadn’t made use of this feature until this most recent reorganization, though. 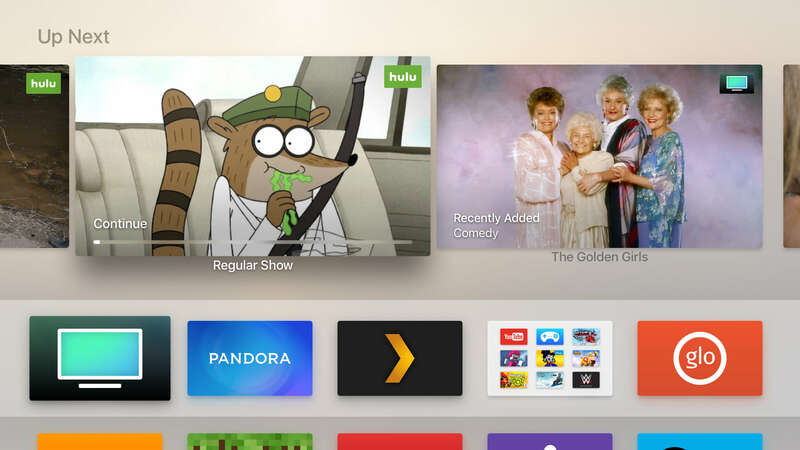 And it brought me to a conclusion that, perhaps, many others have already come to — the Top Shelf is the most powerful user interface element on tvOS. 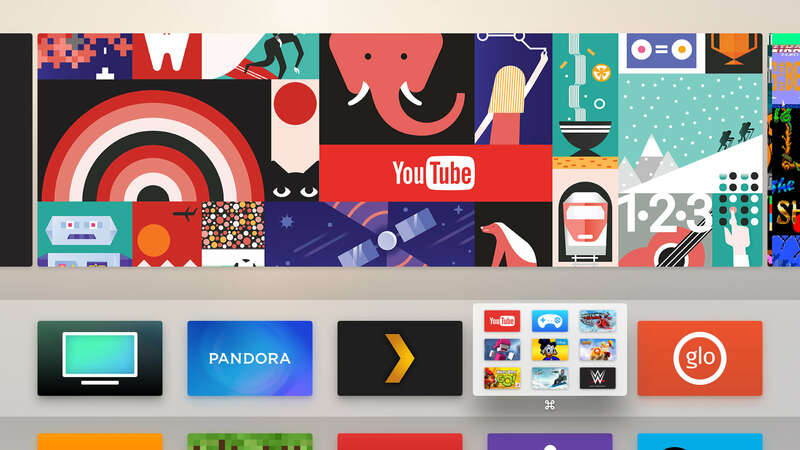 It turns the Apple TV’s boring grid of icons into an immensely practical display of content from within your favorite apps, that you can play straight from your home screen. When organizing my home screen icons, I should be doing so in a way that makes the best use of the Top Shelf. It’s just too transformative of a feature to not use. To discover how developers have implemented their Top Shelf extensions, I started placing each of my applications in the top row. There was a surprisingly wide range of usability between the best and the worst. The standouts were those that surfaced relevant content for me. That seems obvious in hindsight, but it wasn’t until I saw a few different real-world examples that I reached this conclusion. My favorite Top Shelf extension is from Plex. It displays the next episodes of my actively watched shows, recently added movies, music, and TV shows. This is the kind of functionality that other developers should be mimicking — it gives me access to the majority of the content I’m interested in without ever having to launch the app. On the other end of the spectrum we have apps like Crackle and YouTube, which don’t display any content at all. These applications simply display a large banner image. This is fine for games because they don’t lend themselves well to the Top Shelf format. But for video apps, this is just lazy. What’s almost more offensive is the developers who build a bad Top Shelf extension. Hulu is probably the most glaring example of this. Instead of displaying content from your watchlist, which would be a logical choice, it simply displays popular shows. That would be a fair default for instances when no one is logged-in or for brand new users, but this is what appears for everyone, regardless of how full your watchlist is. Luckily, Hulu users can use the TV app to manage their watchlist and hide the Hulu app inside of a folder near the bottom of the home screen. The TV app features a tremendous Top Shelf extension that displays your Up Next queue, which also contains recently aired and actively watched shows. This also happens to be my preferred way of interacting with the TV app. At this point, I only launch the app when I want to browse for new items to add to my Up Next queue. The Netflix app is another example of an aggressively mediocre Top Shelf extension — displaying a generic collection of popular content, trending content, and new releases rather than presenting a selection of videos that are tailored to each user. But unlike Hulu, you can’t replace the Netflix app in your top row with an app like TV that offers deep links to video content — you’re stuck using what Netflix offers. This is where the aforementioned folder trick comes in handy. Apps like Netflix, Crackle, and YouTube can be placed inside a folder and launched from the Top Shelf. This turns your top row into a sort-of tab bar for your Top Shelf content and allows you to interact with or launch your favorite apps in the same manner, regardless of whether they have a well-implemented Top Shelf extension or not. Now I’m by no means advocating that you place all of your Apple TV apps in top row folders. At a certain point, there’s diminishing returns. I found folders with anything more than nine apps to be a bit too unwieldy — you’ll end up scrolling forever to find the app you’re looking for. It’s also worth noting that the app carousel infinitely scrolls, so the first, second, and last apps in the folder are the easiest to access. Organizing your Apple TV’s home screen around Top Shelf extensions forces you to make some interesting decisions about what apps you want in your top row. And I’d encourage you to try it for yourself to see what changes you’d make. After going through this process, my top row now includes TV, Pandora, Plex, YogaGlo, and a folder with YouTube, Provenance, and WWE in the first, second, and last positions respectively. I never would have considered placing Pandora or YogaGlo in my top row before this mindset. But their Top Shelf extensions are top notch and accessing content in this manner is an order of magnitude easier than having to actually launch the apps themselves. By contrast, YouTube had previously been a staple of my top row, which I now realize has been a foolish decision. Every previous iteration of my home screen has featured apps without Top Shelf extensions in the top row. But this is a waste of a slot and limits my ability to access the content I’m interested in as quickly as possible. Because of this, I have no interest in placing an application in my top row unless it includes a Top Shelf extension. Developers should take note, if a user thinks so highly of your application that they’re willing to place it in their top row, at least put in the effort to make good use of the Top Shelf area.